Livingston, Montana. Hardcover. Very good. Folio (40.5 x 30 cm), pp. 530. 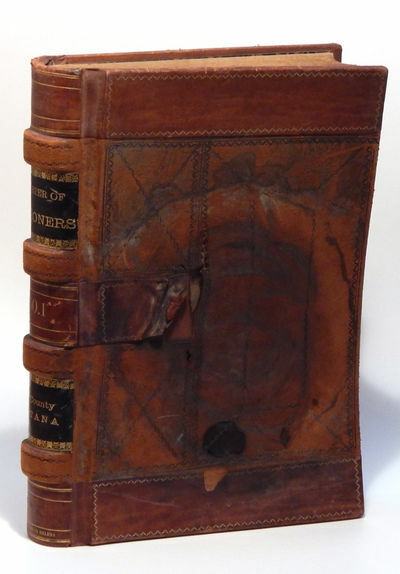 Full leather contemporary binding with gilt and black decoration and spine text. Four raised bands. Red and black marbled endpapers. Produced by Journal Publishing Company, Helena Montana. Manuscript entries on 48 pages (24 leaves) listing over 1,000 prisoners in the Park County Jail in Livingston, Montana. Entries include (for the vast majority of prisoners) name, age, height, hair and eye color, complexion, place of birth, special marks or peculiarities as to prisoner or history, date committed, by what authority committed, offence and term, date of leaving prison, escaped or discharged by what authority, and remarks/action taken if prisoner escapes." Includes one laid-in manuscript leaf, 21.2 x 34.5 cm, of physical descriptions and occupations of prisoners and seven manuscript leaves, bound with two metal fasteners, of the same dimensions, of descriptions and occupations in chart format. No dates are listed on these laid-in leaves. Binding is tight and spine text and decorations are bright and nearly unmarred. Front board is heavily warped and stained with some tearing and chipping to seams, cup ring stain on back board, smudging to text block edges. "Sheriff Conrow and Deputy Sheriff Daniels presided at the 5 a.m. hanging thus described 'Every point for several blocks that would permit even a distant view over the high jail fence was thronged with eager and expectant persons, some of whom had come long distances for this meagre opportunity to satisfy a morbid curiosity. So dense was the crowd in front of the entrance to the jail yard that it was extremely difficult for those who had been invited to reach the gate for admission.'" (Whithorn, Photo History of Livingston. p. 10) The ledger's entry for Field ends with "Hung in the jail yard untill dead." Despite an extensive man-hunt, the murderer was never captured. One item that warrants further research is the arrest of "Cowboy Annie" on Aug. 22, 1889, to determine is this is indeed the famous prostitute written of in Abbott's We Pointed Them North: Recollections of a Cow Puncher, where he quotes the song he wrote for her in 1884: Cowboy Annie was her name /and the N Bar outfit was her game. / And when the beef is four years old / well fill her pillow slips with gold." Annie is also mentioned in Wilson's Honky-Tonk Town: Havre, Montana's Lawless Era.